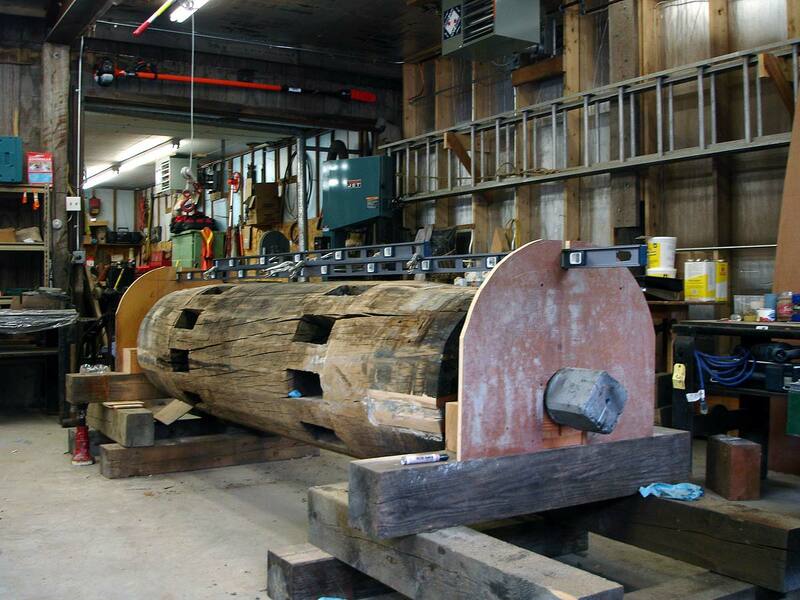 At Hopewell Furnace National Historic Site, Stan Graton II of Holderness, N.H., is reconstructing the waterwheel that once powered the furnace’s bellows. The water-powered bellows fed air to the charcoal-fired furnace at Hopewell, which was founded in 1771 by Ironmaster Mark Bird and operated until 1883. Click on an image to view it in a slide show. At Hopewell Furnace National Historic Site, Stan Graton II of Holderness, N.H., is reconstructing the waterwheel that once powered the furnace’s bellows. The water-powered bellows fed air to the charcoal-fired furnace at Hopewell, which was founded in 1771 by Ironmaster Mark Bird and operated until 1883. Back then, water was the lifeblood of American industry. Graton, the third-generation operator or 3-G Construction, Inc., began the project last year. “In December, we came down, took the old wheel apart and took it home,” Graton said. Which is no minor task, considering the wheel is almost 22 feet in diameter and the center hub alone weighs 3,000 pounds. In his New Hampshire shop over the winter, Graton’s company copied the wheel and built replacement parts. Made from freshly cut white oak timbers, three inches thick by 18 inches wide, each wheel rim section weighs about 100 pounds. Graton said his company worked with green wood because it will spend its life sitting in water. Dipping the ends in bees wax to keep them from checking, they also treated the timbers with turpentine and linseed oil. 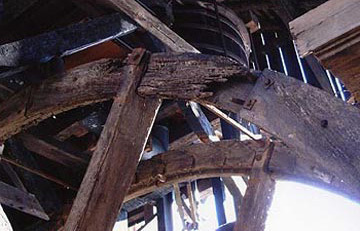 Graton said the wheel was last rebuilt in the 1980s and that a 20- to 25-year life span in normal. 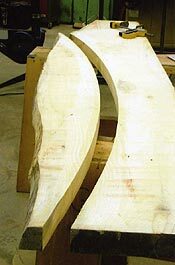 To help add to the wheel’s longevity, Graton said he will use cypress for the buckets into which the water falls. He said he probably would have originally used pine since it is available locally, but it would have had to be replaced more often. All the hardware was custom made as close to the original forms as possible. It isn’t plated or protected from rusting. “They want it to rust and stain as it ages,” Graton said. Graton, and his crew are also working to clear the run between the wheel house and a tributary of French Creek. 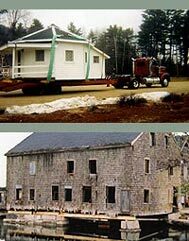 Although this is Graton’s first waterwheel project, 3-G Construction in conjunction with Graton Associates has a long history as architectural preservationists. His grandfather, Milton Graton, started the company Graton Associates and then his son, Arnold Graton, took over Milton Graton's Company. He said some of the projects the company has done include covered bridges and the dome at the New Hampshire state capitol building. “The most unique project we did was the Exeter Town Hall in Exeter, New Hampshire.” Graton said Exeter was the state capitol during the revolutionary war. 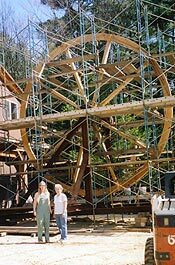 Graton and his crew will continue to reconstruct the wheel through the spring and summer and hope to have it completed for a dedication in August.